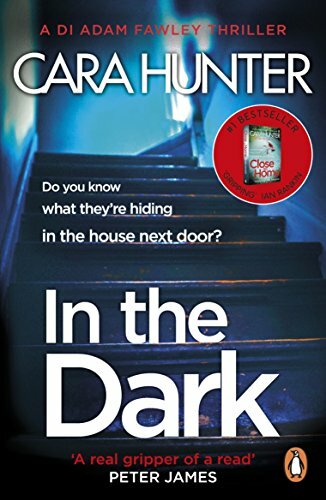 After reading Cara Hunter's police procedural page-turner Close To Home, I turned straight to its sequel, In The Dark. This time, DI Adam Fawley and his team at Thames Valley Police are investigating the shocking case of a young woman and a toddler found imprisoned in a cellar belonging to the home of retired academic William Harper. The woman is too traumatised to speak, the child too young. Harper, suffering from significant dementia, is confused and aggressive, but can this frail old man really have been responsible for such a horrific crime? And could the case be linked to the disappearance of another Oxford woman a few years previously, a woman whose own little boy was left hiding at the scene of the crime? The story that unfolds is a complicated one, full of twists, turns and red herrings, and the investigation is stalled at times by the team's mistakes. Like Close To Home, this is not so much a whodunnit as a whodunwhat, and suspicion shifts back and forth between characters almost by the chapter. There's more in this book about the police team's private lives, too - Fawley's in particular. Fawley is a tremendously likeable and believable lead character. He and his wife are coping with the loss of their son (which we learned about in Close To Home) but there are none of the clichés here of the detective-with-the-troubled-marriage, and no artificial quirkiness. He's not a stereotypical maverick cop with authority issues - he's a solid, decent, everyman who cares about the truth, and it's Fawley and his team (well, most of them - there's one particular copper in this book who doesn't cover himself in glory) who provide a counterpoint to the bleakness of the abduction and murder storylines. Some of the details of the two cases under investigation in this book are somewhat disturbing, and once or twice I felt things were described that would have been better left to the imagination and it's hard to know at what point some details might be considered gratuitous and everyone will draw the line in a different place. But, like its predecessor, In The Dark is fast-paced (even at 450ish pages) and peppered with cliffhangers. The further the story progresses, the more often I felt my jaw about to drop - there are certainly a few 'Wait, what?' moments, but for this kind of book that's entirely proper. I'm already looking forward to the third instalment in the series, No Way Out, set for release in March 2019.